The cryptocurrency has soared past $5,300 for the first time ever. Bitcoin is back in a big way. 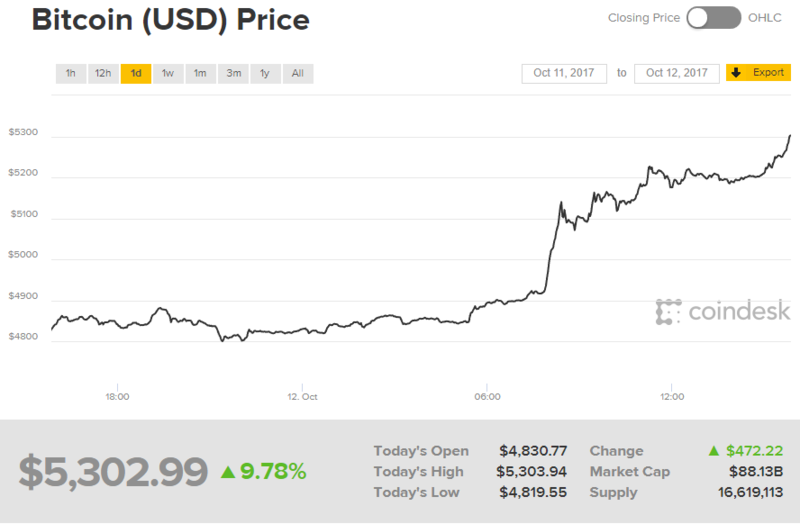 After a few tumultuous weeks caused by some intense government regulation from states like China and South Korea, and fears of impending bans in Russia, Bitcoin has been able to rally and surpass its previous record value established in early September. Prices soared to $5,314.06 at the point of writing, beating the previous record of $5,013.91. Prices were expected to take a dip after the cryptocurrency hit the $5,000 point as some investors likely had sell orders placed for that milestone. However, China’s announcements about the temporary ban followed by other developments played a major role in the tumult that followed. Bitcoin prices have achieved 424 percent growth since the beginning of the year, proving that the cryptocurrency is particularly resilient, contrary to some assumptions. Bitcoin could be back on track with its meteoric rise. Experts seem to be unphased by the rollercoaster changes of the past few weeks. Speaking during CNBC’s Fast Money segment, former Fortress Investment Group hedge fund manager turned cryptocurrency investor Mike Novogratz predicted that Bitcoin will reach heights above $10,000 in the next six to ten months. The cryptocurrency market is anything but stable. There is no definitive way to predict how it will perform in the coming days, let alone weeks or months. Still, whether crypto is a bubble or not, there’s no doubt that it is disrupting the financial sector.